The Arenal Volcano is located in Costa Rica’s lush interior northern lowlands. In a country known for its natural beauty, the Arenal Volcano stands out for its breathtaking scenery and endless activities. The cone shaped volcano initially attracted visitors for it’s eruptions of lava and smoke which began in 1968 . Since 2010, the volcano has been in a phase of slumber and scientists can only speculate as to how long this will last. However, there is no question that the volcano area is worth visiting. The Arenal Volcano is an approximately a 2.5-hour drive from the San Jose airport and 3 hours from the Liberia airport. 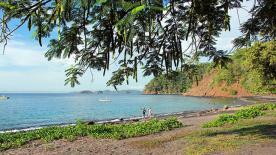 It is also accessible from within Costa Rica by a commuter plane. The town of La Fortuna is on the eastern side of the volcano and the hotels dot the landscape surrounding volcano’s base from the north. This is the largest town in the volcano area and it maintains a quaint, authentic feel. This is a good place buy souvenirs, stock up on sunscreen, bug spray, snacks, etc. There is even a clinic if needed. 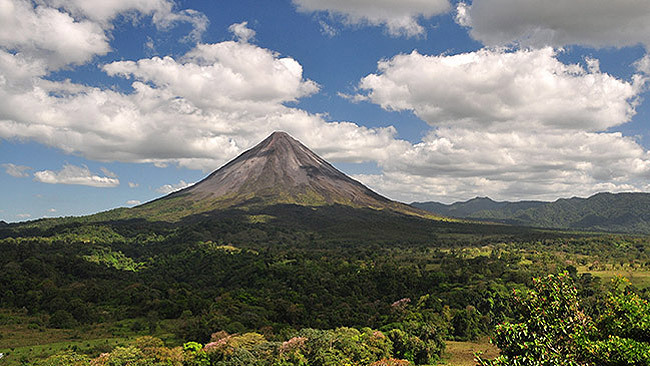 The Arenal Volcano area is a paradise for naturalists and adventurers alike. Animals inhabiting the area include monkeys, sloths, deer, tapir, jaguars, coatis and snakes. Birders will be thrilled to find that nearly all of the 850 bird species identified in Costa Rica can be found in the area. Plant life is abundant and orchids, heliconias, ferns, laurel, palms, bromeliads and strangler figs can be seen while hiking. The rugged terrain, rivers, and lake provide the stage for countless activities. The volcano is thought to have been dormant until 1968 when it surprised its nearby inhabitants with blasts that reached up to 12 km and killed over 80 people. Following the eruption, farmers were disappointed when some of the watering holes that their cattle frequented became too hot to drink from. The geothermal activity did end up being beneficial to the area by attracting hot springs enthusiasts. The Arenal Volcano stands at an impressive 5,300 feet. It rises up from a dense forest and is characterized by its perfect cone shape and ash gray peak. The nearly 30,000-acre area surrounding the volcano and it’s neighboring volcano Cerro Chato was declared a National Park in 1991. The volcano is flanked by Lake Arenal which is the source of 12% of Costa Rica’s hydroelectric power. 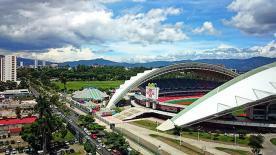 Temperatures average from 75-90 degrees F.
There is a wide range of attractions in the Arenal Volcano area. Tours with transportation can be arranged so visitors can explore nature, experience the local culture, test their physical limits, or feel the rush of adrenaline. 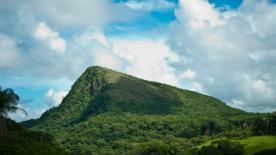 The Arenal Volcano is a great place to explore the beauty of Costa Rica’s forests on foot, bike, horse, and ATV. For those who enjoy water sports, there are plenty of activities to choose from. For a more leisurely pace, a river float or aerial tram can be arranged. This is a great destination for spotting birds like toucans, parrots, hummingbirds and with some luck the resplendent Quetzal. Sloths, monkeys, toads and snakes are native to the area as well. The climate at the Arenal Volcano is variable. It does tend to be drier February through April although light rain gear is recommended throughout the year. Temperatures range from 75-90 F so it best to dress in light layers. The Arenal Volcano is a very popular destination with a wide variety of hotel options. They range from simple and rustic to the most luxurious resorts in the country. Although Costa Rica has excellent all-inclusive hotels on the Pacific Coast, they are not common in the Arenal Volcano area, but many hotels do include breakfast with their rates. If you’re planning a trip with your family, we recommend watching our Guide to Family Travel in Costa Rica, to get the best tips on how to plan a family vacation, where we also share insights on hotels in the Arenal volcano area. The town of La Fortuna is on the eastern side of the volcano and the hotels dot the landscape surrounding volcano’s base from the north. This is the largest town in the volcano area and it maintains a quaint, authentic feel. This is a good place buy souvenirs, stock up on sunscreen, bug spray, snacks, etc. There is even a clinic if needed. Most of the hotels have restaurants that are open for breakfast, lunch and dinner. For even more variety, the town of La Fortuna is a taxi ride away from most of the area’s hotels. Both traditional Costa Rican and international cuisine is available. Public transportation: Yes, frequent buses run from San José to La Fortuna (route via San Carlos is shorter than via Cuidad Quesada). Taxis work from 6 a.m. to 10 p.m.
Shopping: Shopping is abundant, from larger grocery stores to roadside fruit stands and open-air souvenir shops. Most are open from 8 a.m. to 8 p.m.
Gas stations: There are two gas stations available 24/7 (gasolinera Fortuna & gasolinera La Cristalina, 7 km away from La Fortuna downtown). Nearest medical facilities: There is Red Cross in La Fortuna (24/7), public clinic, as well as several private clinics and at least three drugstores located at La Fortuna downtown, open until 8 p.m.